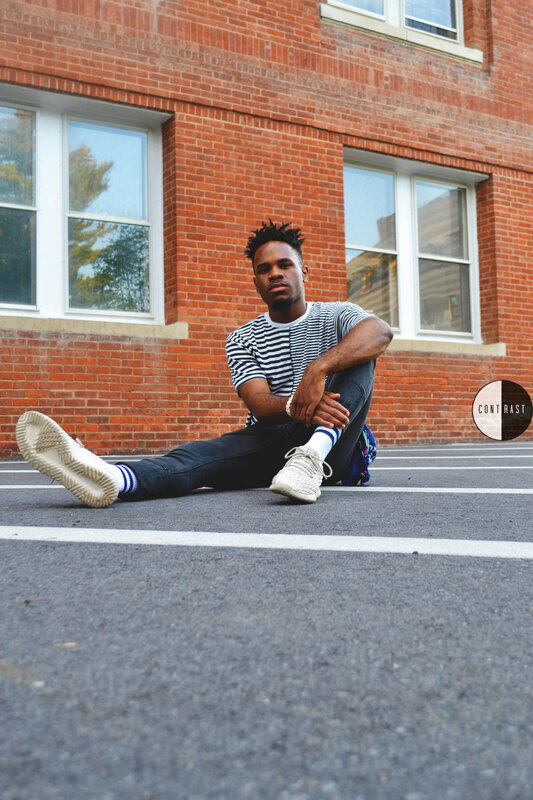 Contrast’s Blog Director, Alaina Toatley, speaks with Vassar senior Frances Kundi, also known as KunD!, an up-and-coming R&B artist. KunD! discusses his inspirations, failures and goals – from Michael Jackson to his mom. Alaina Toatley: What made you start singing? KunD! : Oh… [laughs] these are deep questions! I started singing when I was in elementary school, mostly to myself when I was making my bed or doing the dishes. It was just something I would do to pass the time. But then I started taking guitar lessons in fifth grade, and our class made a makeshift band. At the end of the year we had a concert, and they were looking for people to sing “White Stripes” by Seven Nation Army. That was the first time I ever sang live. I was like, “Why not try it?” because I thought it would be fun. Singing on stage for the first time was a really good experience, I realized that I had a lot of fun and I felt a lot like myself… Well, as much as I knew about myself at that age [laughs]. When I was on stage performing, I knew it was something I enjoyed doing and wanted to do more. I didn’t really decide that I wanted to be a recording artist when I grew up, I just thought that I wanted to keep doing this, that I wanted to keep singing. So that was my first introduction to singing and performing, and from there it started. In terms of making music, and becoming a recording artist, I realized that I wanted to do that when Michael Jackson died. AT: Why? Just because you wanted to become a legend, or because you wanted to be like Michael Jackson? KunD! : Kind of both, because at that age I was like “Wow this guy’s crazy, this guy’s amazing, I wanna sing, I wanna dance.” It was partly the obsession with him and his legacy, but also he inspired me to perform and make music for people, and for people to enjoy the music that I make. So back then, my view of becoming a recording artist was more infantile, because I didn’t really know what went into it. I just knew that I wanted to be like Michael and perform on stage. But that was when I knew that this is what I want to do. AT: What’s the biggest lesson you’ve learned since making music and singing? KunD! : You have to be patient. You can’t give up, you can’t lose hope – patience is the most important thing. Like with anything it takes time, but especially with music, it takes time. You have to keep at it and keep your mind open, and take every experience as growth as an artist. That’s been the biggest thing for me, not to overshoot things and to take things as they come, and just pace myself in terms of making sure I learn and grow from each experience I take. AT: Have you had any big failures or regrets, or opportunities that you’ve missed? KunD! : Nothing huge. The only little regret or “what if?” that I have is during my sophomore year when I considered dropping out [of college] to fully pursue music, because that’s when I came to terms with the fact that I wasn’t really doing what I wanted to do here [at Vassar]. I realized that if I was going to do anything with my life that it would have to be music, and I wanted to pursue it with all my focus and attention. I didn’t want to waste time doing anything with school. I was really intent on dropping out, but I didn’t; I’m still here. So I guess a “what if?” would be if I did drop out at that point, where would I be now, in terms of music? AT: Where do you think you would be? KunD! : I don’t know, I honestly can’t say, because anything could’ve happened. AT: Is that something you currently regret, staying in school? KunD! : Yeah a little bit, I feel like I maybe missed out. And with the frustration of being here and not pursuing what I want to do, feeling like I can’t do it fully. But, being here has given me opportunities to still work on my music and make certain connections. I was able to meet artists. Here I was able to meet the two people who I formed the collective with that I’m in now – Nick Versailles and Khasi Jamieson. Nick first opened me up to the art of making your own songs, and I feel like if I didn’t meet him while being here, where I am now would’ve been different. Meeting him definitely helped give me a good start to making the music that I’m making now and putting me on the path that I want to be on. Good opportunities still came. AT: Since you stayed, let’s talk about what you’re studying in school. KunD! : I’m a Japanese major. It’s probably the only thing I could’ve majored in while being able to tolerate being here. It’s definitely tough, especially now when there’s a lot that my classes are throwing at me. I really like the culture and the language, that’s the main reason I decided to stick with it and study it. It feels like a personal benefit, and it’s something that I can probably use down the road too. AT: What do you think you’ll use it for? Do you want to go to Japan at some point? KunD! : I do, at some point before I die [laughs], but it’s been a low-key dream of mine to someday create my own Anime series. AT: What are your plans post-graduation? KunD! : Post-grad I want to find a job that will help sustain me. I’m looking primarily in New York City, but really wherever can give me a good offer. After college the plan is really to go at it with everything I’ve got. KunD! : Not really, I’m actually really excited to get out of school. I know the process of finding a job and everything is going to be hard; a lot of things in life are hard. But it doesn’t scare me that I don’t know the job I’m going to have after school. I don’t know if that’s a weird thing or a good thing… I’m just ready for whatever life is willing to throw at me. Because I know that my goal is going to stay constant, no matter what happens. AT: Do you have anything coming out soon that you’re excited about? KunD! : Yes, the collective I was talking about with Nick and Khasi. We’re currently planning the release date of our joint EP. We’re shooting strongly for the end of October. AT: Are you nervous for that? KunD! : I’m actually kind of excited! A lot of good stuff is on it. Stuff that I’ve already done, and stuff that Nick and Khasi have done too, so I think it should be really good. It will be a good step to see where I should go from there. It will be my first full-length project of any sort, so it will be good to see where that leads and where to go from there. AT: Is there anything that you’re really proud of? AT: It’s okay to be proud of yourself! KunD! : [Laughs] How I’m pacing myself and my outlook on this whole process. There are definitely a lot of struggles that internally I’ve gone through with being here and trying to balance school while pursuing music as hard as I can, but I’m happy that I’m going about it in a way that won’t put too much stress on myself. I like where my head is.